CAT – Catalina Coupon. This is a coupon that you receive from a Catalina machine after you make a purchase at a participating store, thus the name. Stores include Walgreens, Target, Jewel-Osco and various other stores that you may have in your area. At Walgreens, the Catalina machine is the machine from which you’ll get your Register Rewards. Catalina is a third party company that works with specific stores and brands to produce coupons. These coupons can be either manufacturer’s coupons or store coupons, so be sure to look at each individual coupon. You can stack additional manufacturer’s coupons with the store coupons produced from the CAT machine, so this would be an ideal opportunity for extra savings. ECB – Extra Care Bucks. This is a CVS store coupon that prints out at the end of your receipt during participating CVS purchases. This coupon is good for one month and valid on any future purchase at CVS (other than restrictions: lottery tickets, milk, money order, gift cards, stamps, pseudoephedrine and alcohol). You may use as many ECB as you have available toward the same transaction. ETS – Excludes Trial Size. Verbiage that is typically found printed on coupons. GM – General Mills. This is a coupon insert that is distributed in the Sunday newspaper on the occasional weekend. P&G – Procter & Gamble. This is a coupon insert that is distributed in the Sunday newspaper on various weekends. RP – Red Plum insert. This is a coupon insert that is distributed in the Sunday newspaper on various weekends. SS – Smart Source insert. This is a coupon insert that is distributed in the Sunday newspaper on various weekends. YMMV – Your Mileage May Vary. This means that the deal or coupon will work at some stores, but may not at others. It will all depend on your store and that specific manager/cashier. 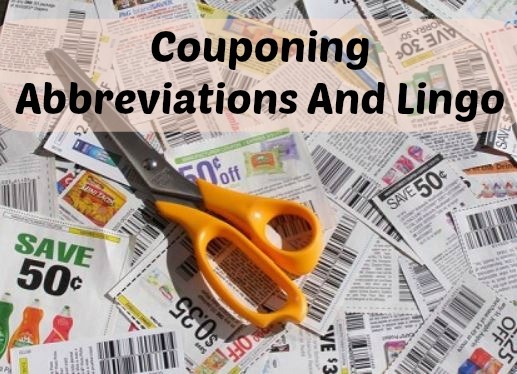 Have a couponing specific abbreviation that I forgot to post here? Please leave a comment and I’ll add it to the list!